Snuggle up close with your little ones to see why the Easter season is such a very happy time. The weather is warming, flowers are blooming, and cuddly critters are leaving their nests. Join the adorable woodland animals as they thank God for all the blessings of Easter. Bonnie Rickner Jensen and Natalie Moore have teamed up once again with another hit that you will want in your nursery. A Very Happy Easter Prayer is a sweet snuggle up read. It is full of spring and sunshine, an adorable family of rabbits, and a simple prayer to our creator God. It is overcast, snowy, and dreary here in Missoula, Montana and my heart is grateful for the refreshing ray of sunshine that A Very Happy Easter Prayer has brought into my day. As a reviewer for FrontGate Media, I received a review copy of this book in exchange for my honest and unbiased review. My thanks to FrontGate Media, the author, and publisher. 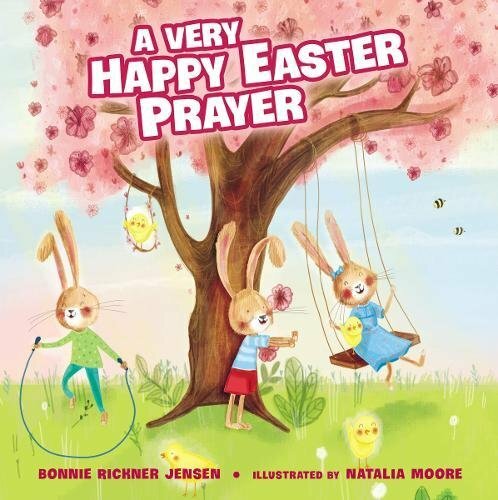 Bonnie Rickner Jensen is a bestselling author, who for the past 20 years has written everything from children's books to gift books to thousands of greeting cards. She's won a Retailer's Choice Award for her book, "I Love You Head to Toe", and also several Louie Awards for her work in the social expression industry. Her inspirations are her grandchildren, running, and sunshine. She writes from her picture book, toy-filled office in Cleveland, Ohio.